No off street parking, so Mike pulled out the dying boxwood, tore down the chainlink fencing, et voila! Off street parking. 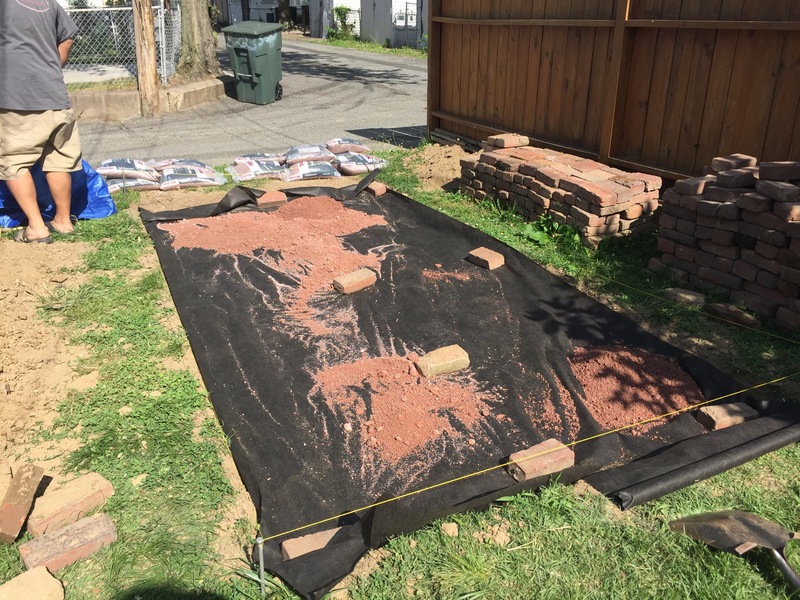 Neighbors on both sides of me put in non-pervious pavers, basically cement, directing all run off towards my property. I’ve kept it bare/grass to encourage drainage, and it is only really a problem one week out of the year. Enter my brother. My amazing brother who always seems up to some ridiculous housing project when he’s in town. How hard could it be? What could possibly go wrong? 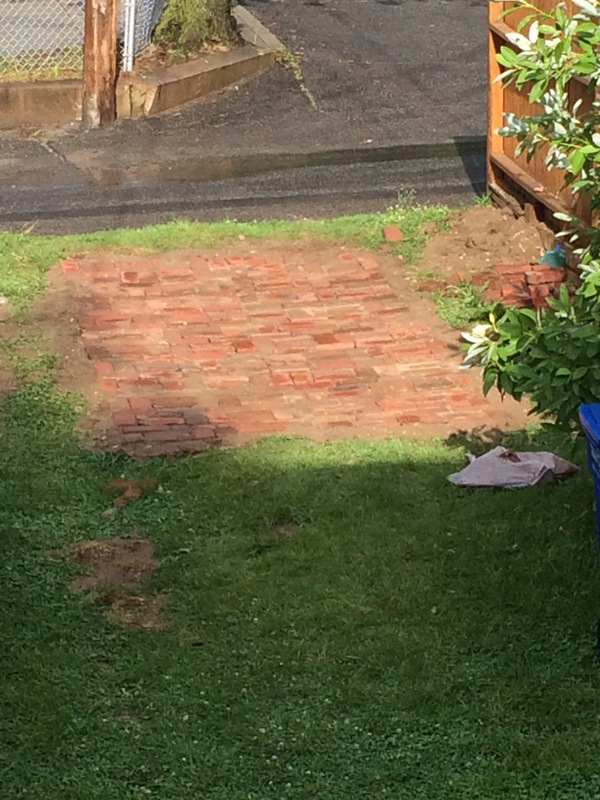 So off we were to get materials to dig a whole and lay brick pavers. 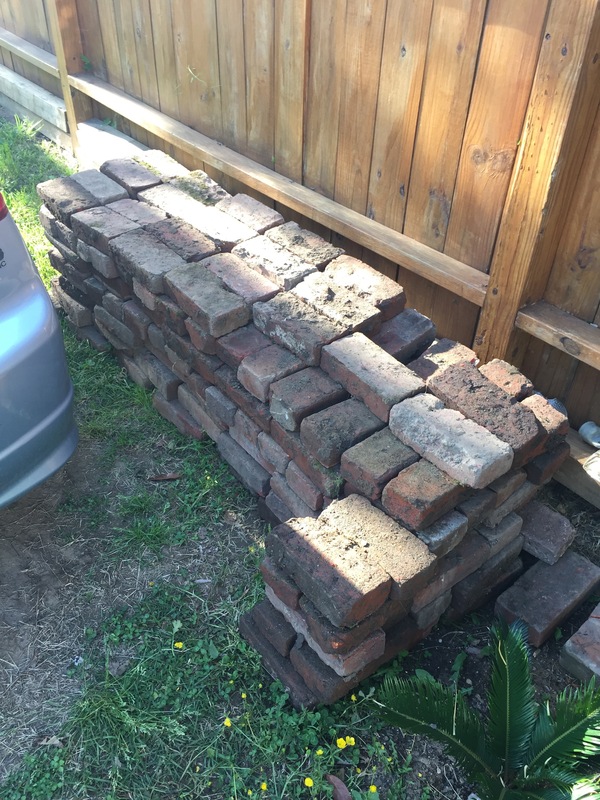 Step one – get brick. 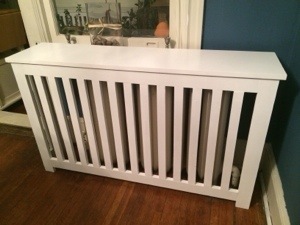 Thanks, Craigslist! And Steve…and Alisha…and Stu…who helped me collect these! 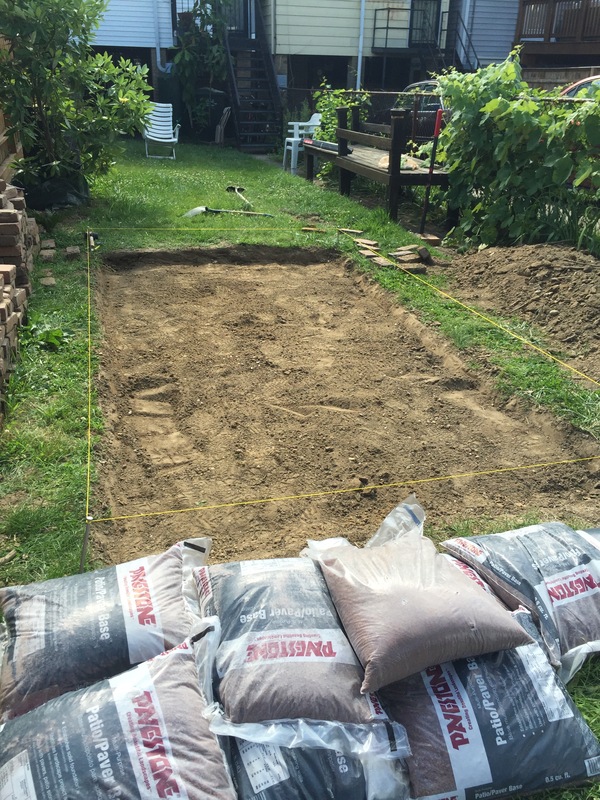 Step two – dig a hole. I don’t recommend doing it on the hottest day of the year, but how were we to know the weather gods would be so cruel? Step three – lay fancy fabric stuff to prevent sinkage, we also used edging to “lock” the pad in place. 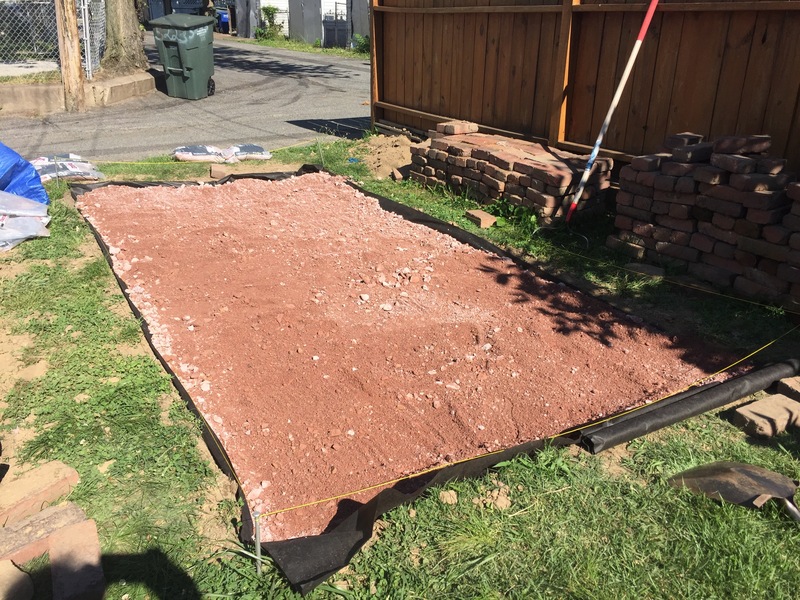 Step four – put the paver base in, even it out and tamp/pound it as flat and even as you can. Not as simple as it sounds, but a fairly forgiving process. 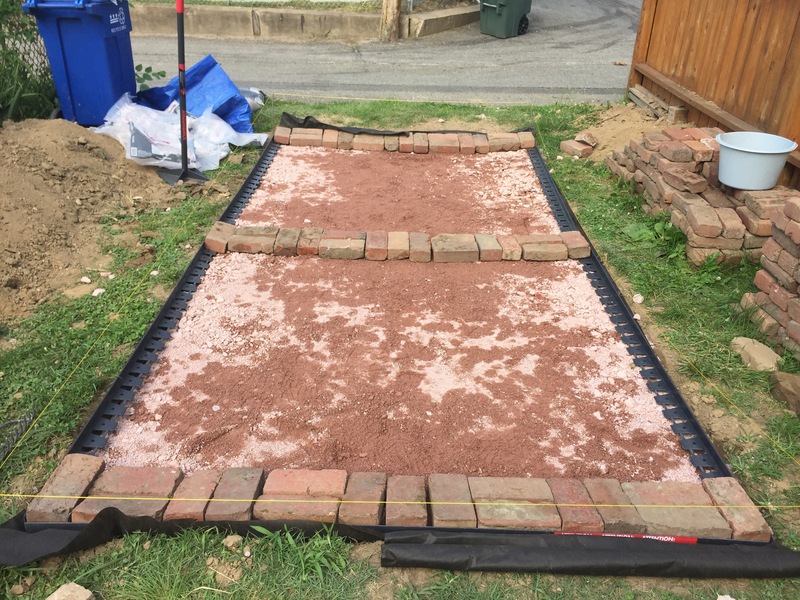 Step five – lay the brick! Surprisingly the easiest part of it all. 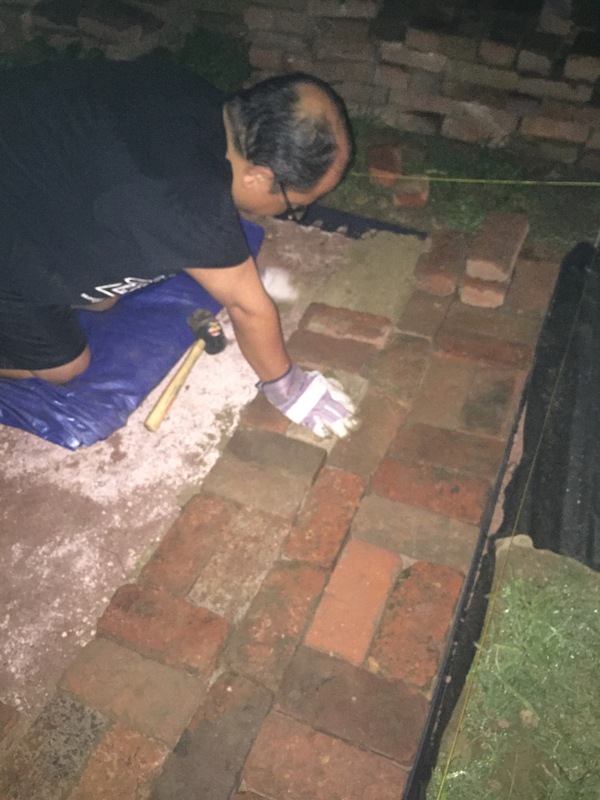 We decided to do most of this at night…so it’d be cooler and because it was going to start raining. Step six – pour fine sand into the cracks to help bind the whole pad together. About that…I just haven’t gotten around to it. I know, no excuse now, it’s been a couple of months, but it’s functioning fine. Maybe I’ll do it this fall before the first snow. I wanted it to be as porous and non-invasive as possible. Almost like it’s always been there. So here is the semi-final product! I overheard my neighbor tell my mom that she thinks it looks great. My mom just kind smiled and said, “My children did that.” Which communicates two things, to me: parental pride and resignation. I don’t think it’s what she had in mind, but in the end, it’s functional, and it was done by her two crazy kids. Just like that ash tray I made her in kindergarten. Except for the fact that she doesn’t smoke, I know she was amused by the effort and product. And I now have a parking pad! Sure it’ll cost more to heat the place, but at least now mom will stop bugging me about it. This in the sunroom. Hopefully it can withstand the weight of the various plants we have in there. And this one in the dining room. There have been threats of putting her Lladros on display. 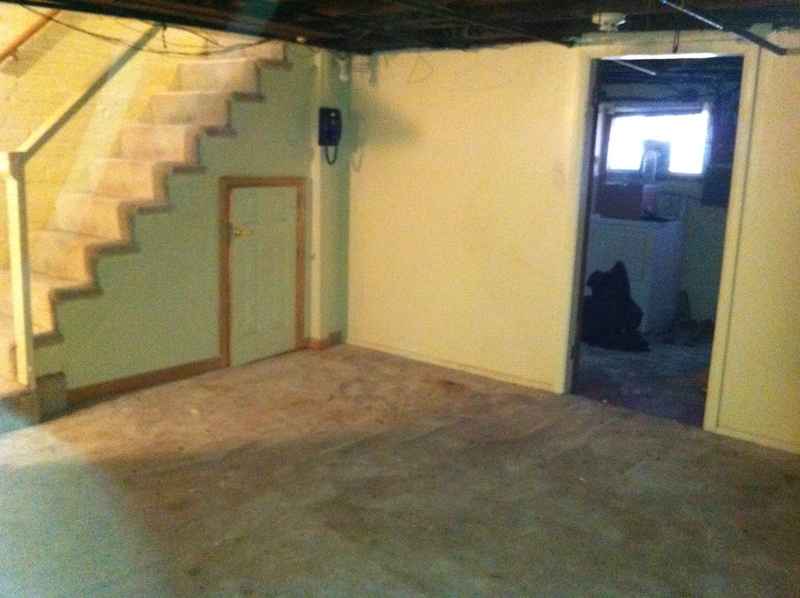 The worst day of home ownership for me actually involves the basement. I don’t think I posted about it because it was too raw and painful of an experience. 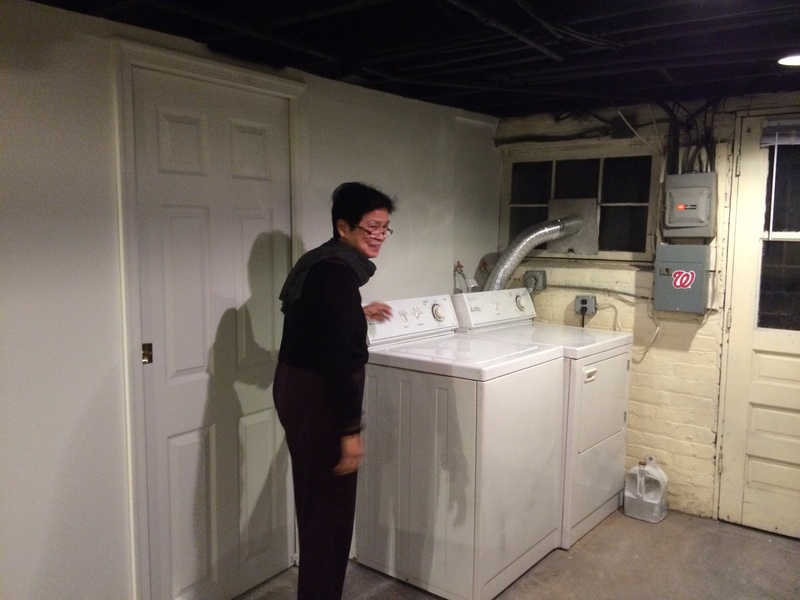 The goal was to move the washer and dryer next to each other. Simple enough, right? WRONG. 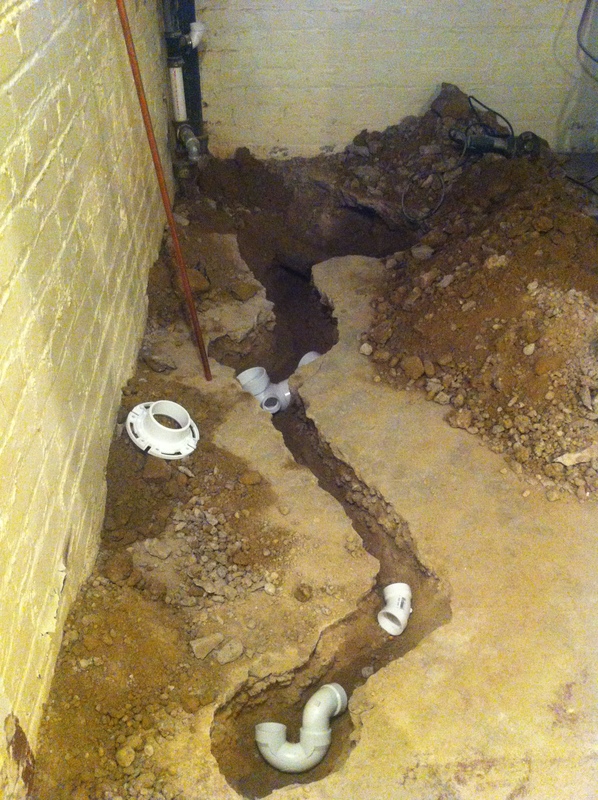 One by one, the water pipes started to burst, from the back of the basement, literally to the main water line. It. Was. Horrible. 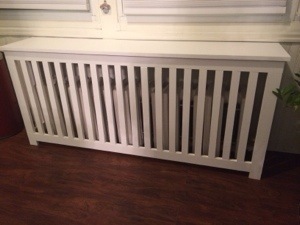 I counted 10+ visits to both Home Depot or Annie’s Ace Hardware to get the right sized pipe, tool, connecting part it was a very cruel welcome to the DIY world. 12+ hours later, we still had leaks and my friend Will STILL had to come back the next day to do one final correction/connection and we were officially SEALED. But in the end, I basically got plumbing 101 certification. They say education is expensive, and at the time I was cursing my stubbornness (and cheapness), but in hindsight, one day of hard labor to know my pipes are now all basically new and sealed is worth it. That said, the only other times I’ve used that blowtorch was to make creme brulee, and I prefer it that way. 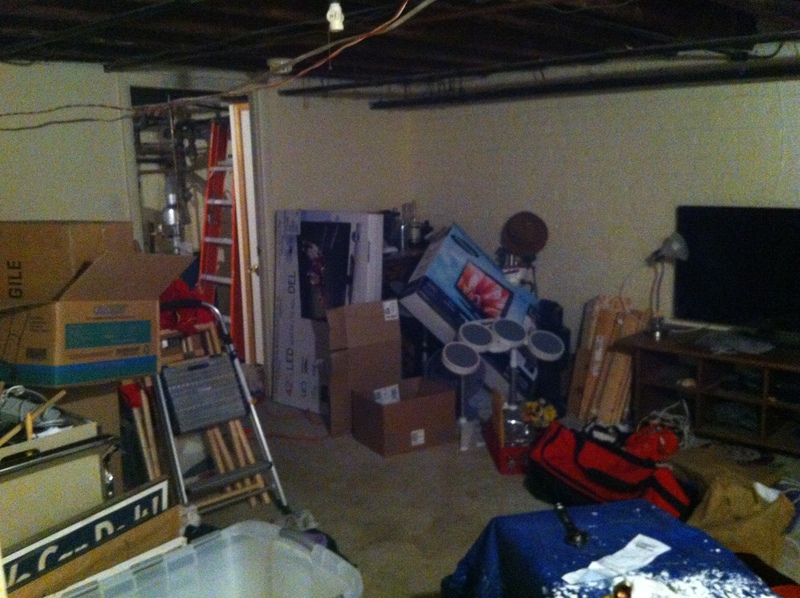 With this task done, I was adamant that NOTHING major be done to the basement, until further notice. I needed time to regroup, save and plot. 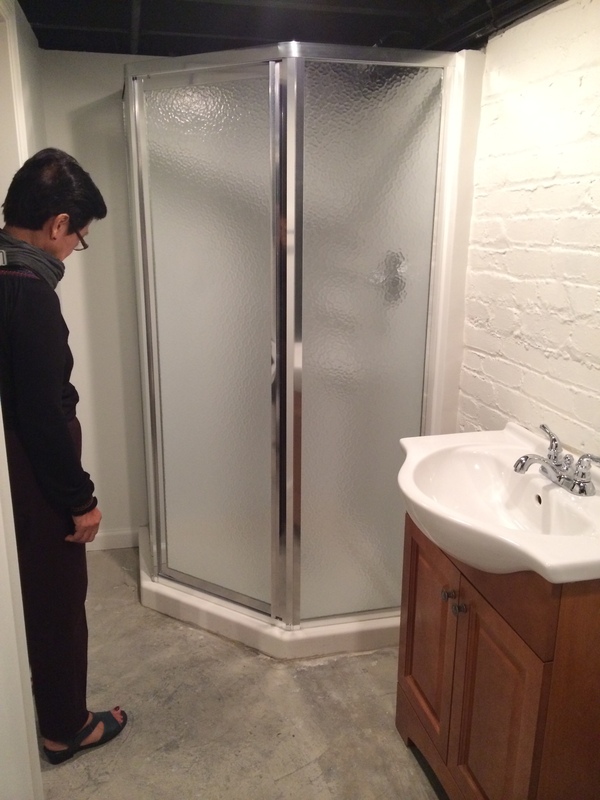 So even discussion of basement renovation was tabled until a later date. 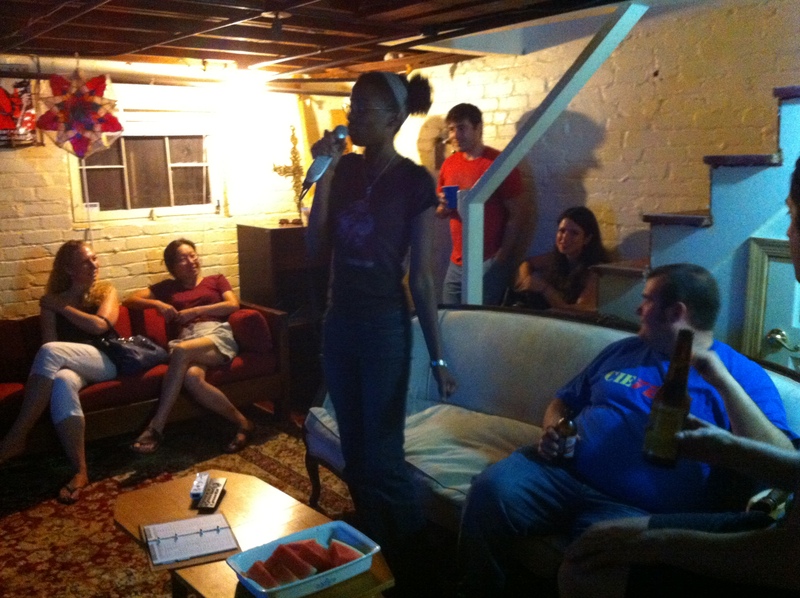 Within only one year of occupancy, the Mancave has served as the venue to countless movie marathons, award show parties, karaoke fests, guest accommodations, and extended stay housing for my nomadic friends. GOOD TIMES. So why mess with a good thing? Well, good question! 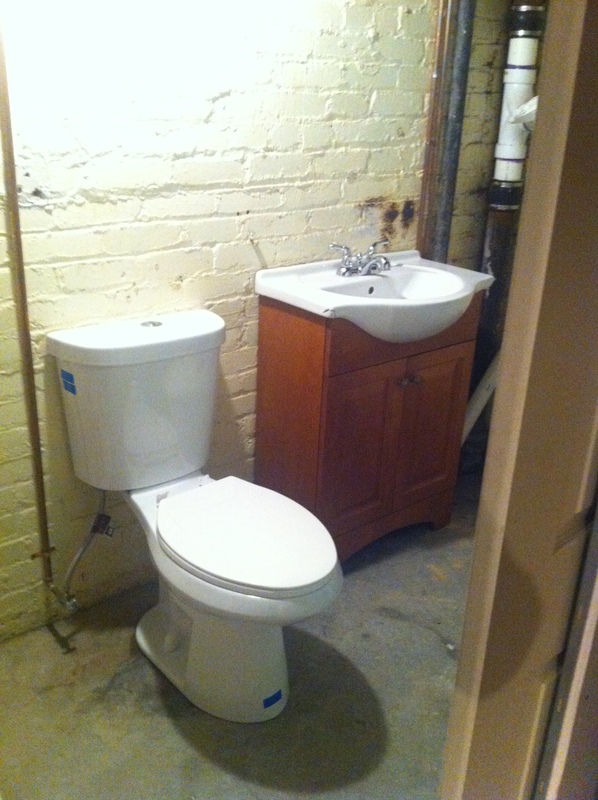 As with so many things in my life, the basement remodel became victim to escalation. 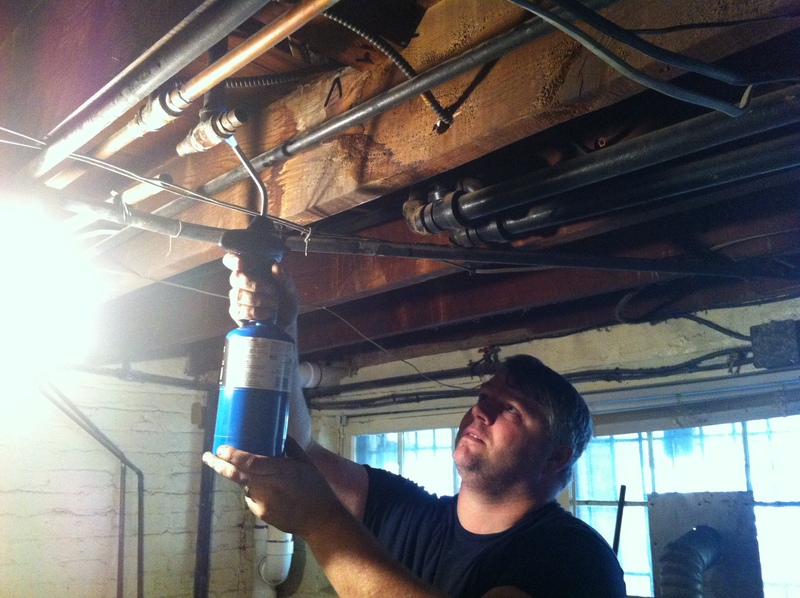 It started with installing overhead lighting. Then electrical sockets. Then – let’s paint the ceiling black! Then, you know what else would be great? 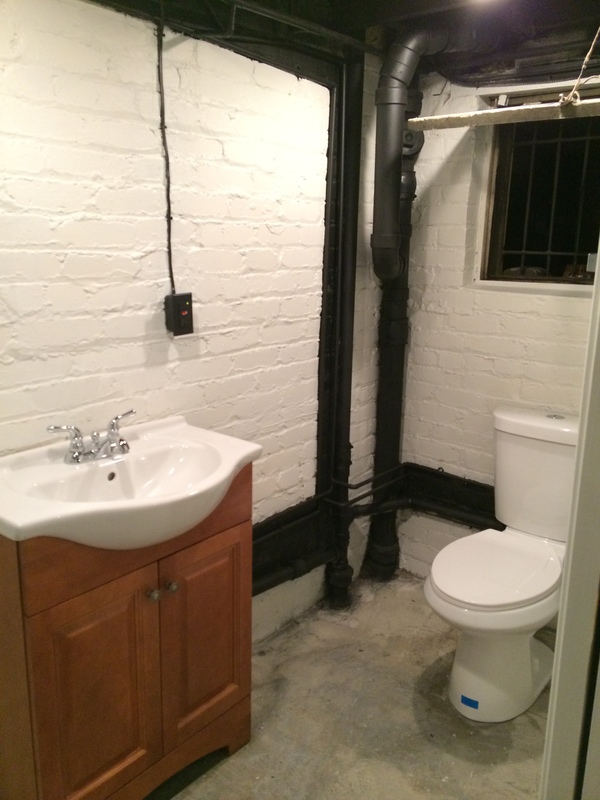 Let’s add a bathroom. More on that in a previous post. 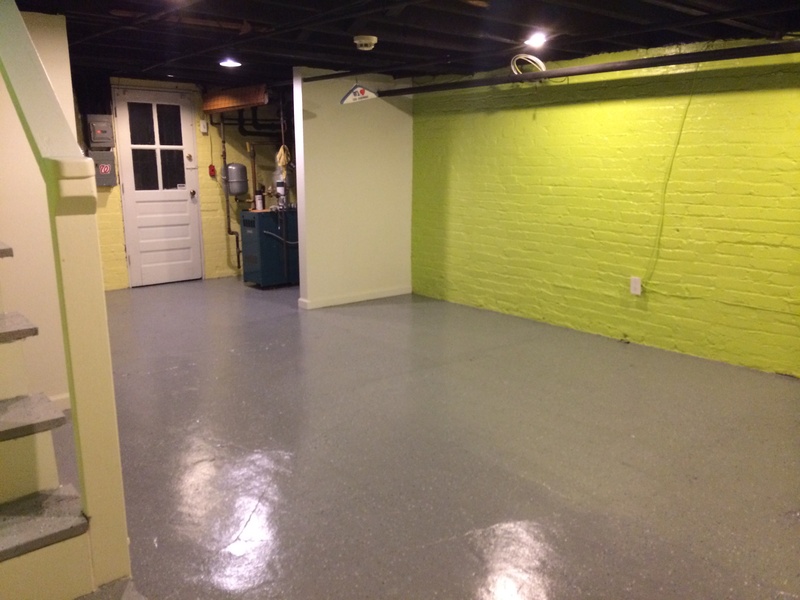 The wall that separated the washer and dryer room was taken down to accommodate the bathroom addition, and the room got a fresh coat of paint on all surfaces. Still toying around with room set up. But have decided that TV stays on the biggest wall. And I’m not getting new furniture, at least not immediately. So there will still be a bit of the Mancave spirit in this new calypso iteration. If I’m ever home long enough one of these weekends, I’ll start restocking the bar and sorting through all the stuff that was moved upstairs that doesn’t need to be moved back downstairs. Georgia Avenue Thriftshop is going to get a sizeable donation from me soon! And there you have it friends. 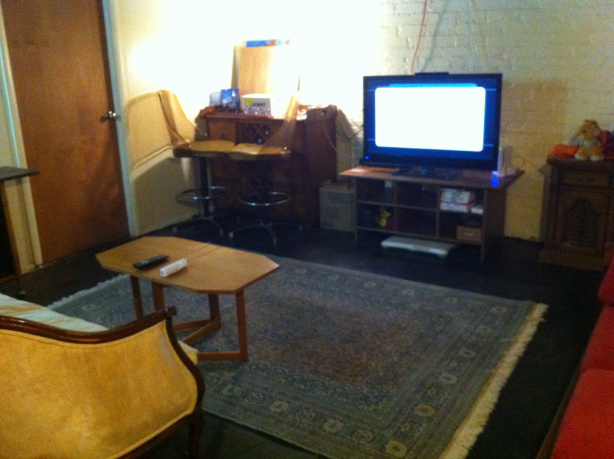 I hope this space continues its mission of facilitating epic events of Mancave worthiness. A launch party for is scheduled for Veteran’s Day Weekend, in conjunction with my annual themed potluck of “Food From Countries We’ve Invaded.” We are also rolling out a new karaoke machine and surround sound. Hope you can make it. So NOW what? Well, the fabulous flooring adventure of 2013, of course. 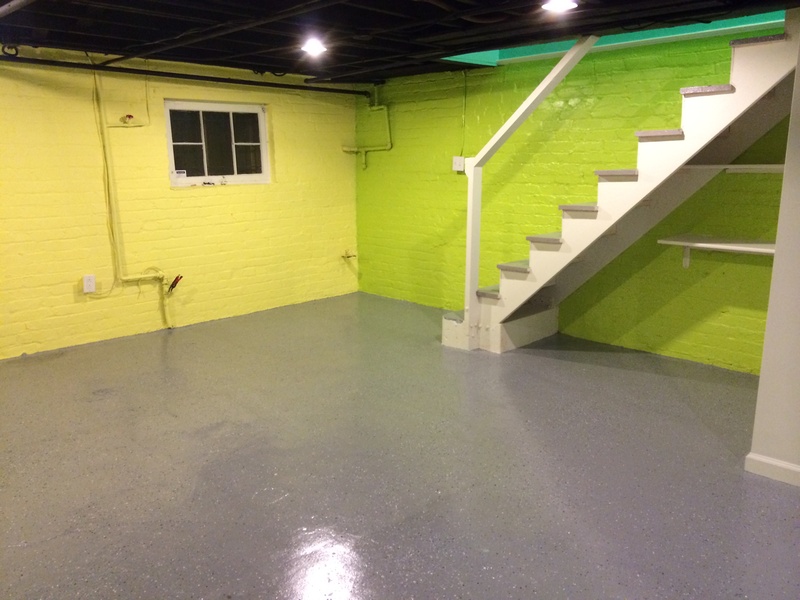 Everything has been cleared out of the basement and we are going to epoxy the floor and paint all the walls. The place already feels roomier and more spacious. The Miami Sound Machine inspired colors are going to brighten up the mancave so much, we may just need to come up with a new name for it. 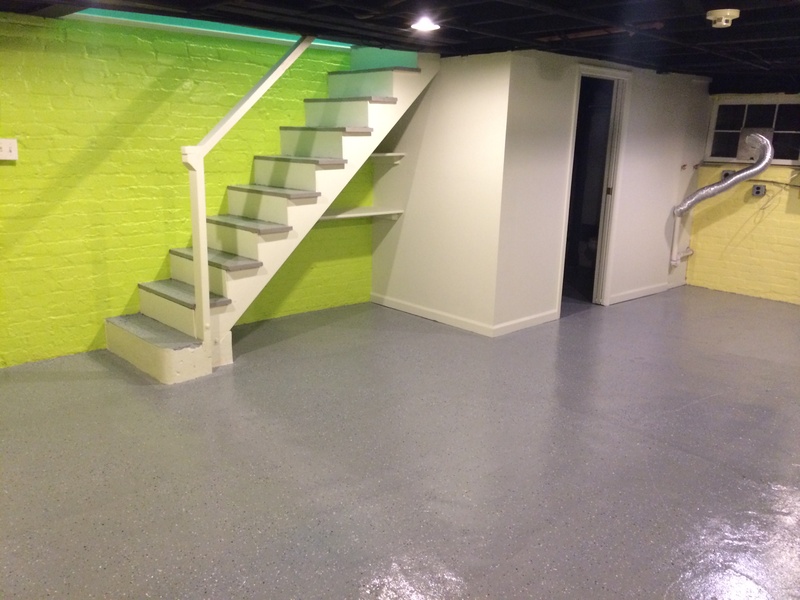 The basement is the coolest room in the house, both literally and figuratively. It’s where I put the TV. Set up up the Wii. The bar. The turntable. The 1920s sofa. And four groovy 60s bar stools. Even on the most disgusting summer days of July and August, the basement is comfortable with just a fan. I’ve basically made it my refuge from the heat, and the rest of the outside world. 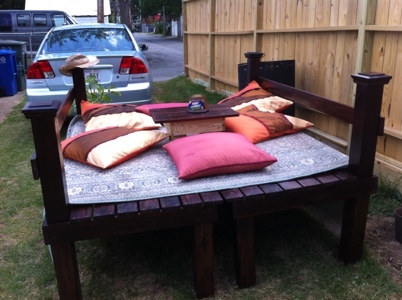 I ripped out the carpet, painted the floors black, threw down a carpet that was an amazing yard sale find and VOILA! Shabby chic indeed. I’ve referred to it, ironically, as my “man cave.” A place where me and my friends can relax, shut out the world, drink and be as lazy as we want. No judgements. Since this picture was taken, I’ve also added hooks on the wall for the “regulars” to use the same mug every time they come over for a beer. It will be interesting to see how it evolves once it gets cooler, but as it also currently doubles as the “guest room,” people have consistently said it’s one of their favorite places in the house. 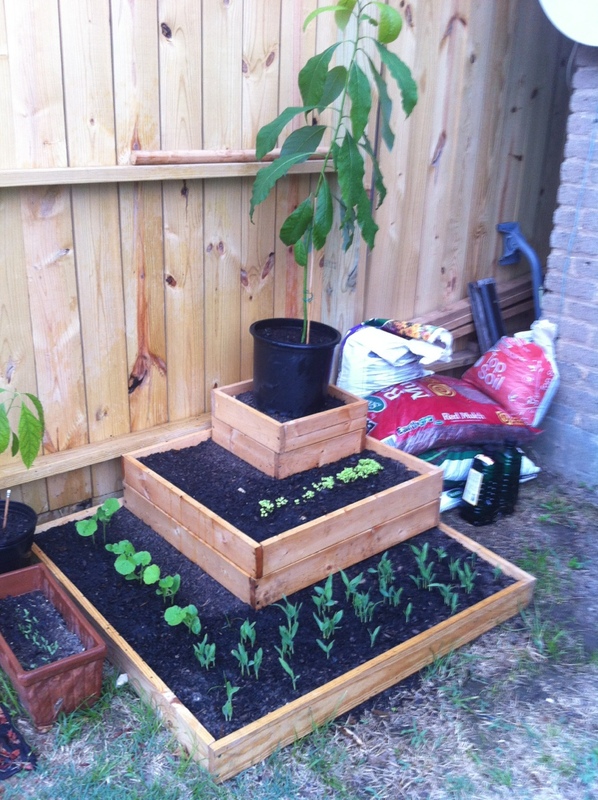 Saving room for eggplant, but we have spinach mustard/tatsoi, squash, corn and an avocado tree. Yes, I said corn! Don’t worry, we’ll replant the stalks along the chain link fence when ready! After returning from the Peace Corps, I’ve always thought the Central Asian tradition of lounging under mulberry trees while drinking green tea was something I’d like to one day do in my own house, in the USA. Well, thanks to my brother – it’s come true. My brother built me an Uzbek inspired “tapchan” that was officially broken in this weekend at my housewarming/summer solstice crabfeast. What amazed me is how perfectly natural it seemed for me to have one – not to mention how quickly my friends came to appreciate my having one as well! 44 adults, 6 children, 2 babies and 1 bunny rabbit later, it sits strong and beckons me daily to live a slower and happier life. 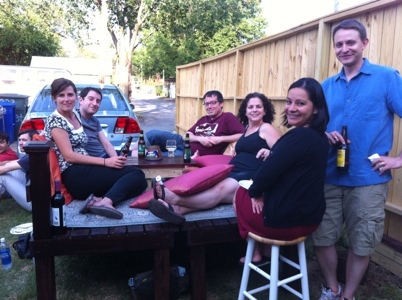 It was a wonderful housewarming and I think I can officially say this house is now a home.